floating world: "Please Think of the Children!" Yes, Mads Mikkelsen is great as Lucas, a kindergarten teacher who's falsely accused of sexual molestation in a small, tight knit community. He deserved the best actor award at the Cannes and everything. But it's Vinterberg's regular Thomas Bo Larsen who plays Theo, Lucas's best friend and the father of a little girl whose little lie that starts up a shitstorm, really shines here. 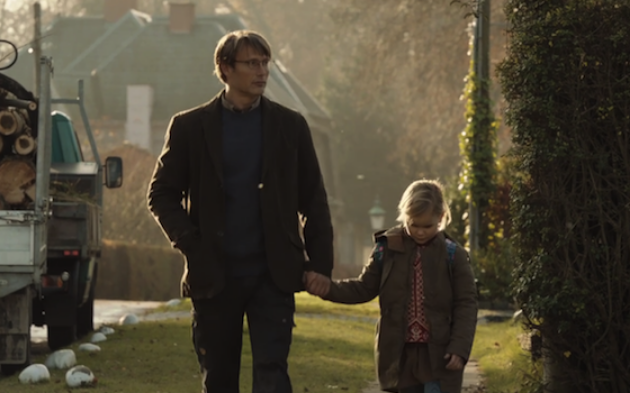 Vinterberg is smart not to make it a courtroom drama or about the loss of innocence. It still retains the sharp critique on the 'please think of the children' mentality and deals with thorny subject expertly without sacrificing the narrative. The Hunt is about simmering tension underneath the society that looks picture perfect. That even someone as well regarded and decent like Lucas isn't safe once the seed of doubt is planted. The Hunt is a less grandiose, down to earth Haneke film. It's a chilling reminder of once well to do northern Europe and its turmoil in a much more complicated world. The ending is really chilling. Hey Dustin, I am so glad you posted this. I have this on my list on my Netflix and I tried watching The Hunt the first few minutes but got bored. After reading you post, I will most definitely watch the entire movie.